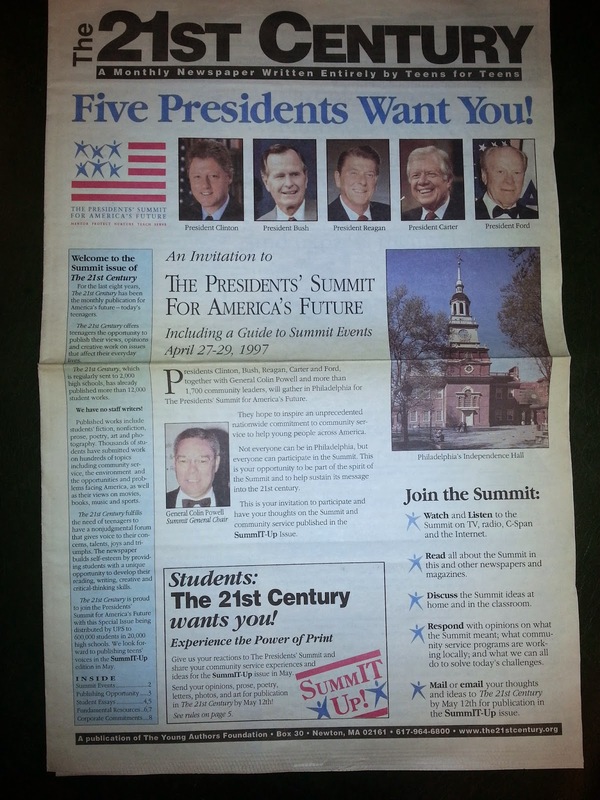 This is the back page of an 8 page newsletter that I picked up while attending the 1997 Presidents' Summit for America's Future event in Philadelphia. 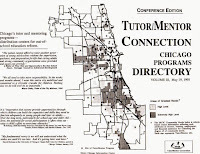 I was a Chicago delegate, and my organization, the Tutor/Mentor Connection (T/MC), was one of 50 Teaching Examples with booths at the Summit. I was hoping this event would launch a wave of reinforcements (talent, dollars, ideas, etc.) 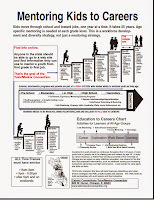 to support site based tutor/mentor programs in Chicago and other cities, as well as intermediaries like the T/MC who were collecting and sharing information, and organizing events, intended to draw these resources directly to tutor/mentor programs. 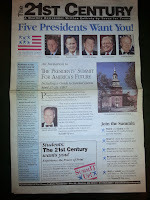 I tried to find this organization on the web site, but it no longer exists, at least under this web address. The organization supporting this effort is TeenInk.com, which you can find here. 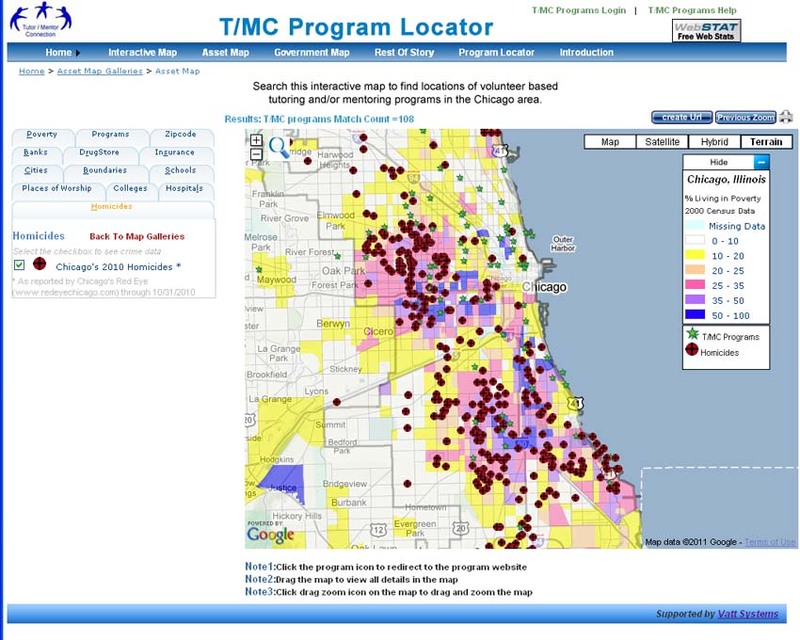 As you can see from this graphic I've been collecting information about Chicago tutor/mentor programs since before 1995, and have been using maps to show where existing programs are located as well as where more are needed, for just as long. I've yet to see the President, Mayor, national leadership groups like America's Promise, etc. use maps consistently and for the purpose of drawing resources to places already operating, so each could constantly improve. 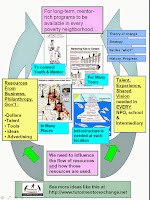 Below is one of several illustrated essays I've created to show how leaders can, and should, be using maps. I sat next to General Colin Powel in a small Chicago meeting in 1997 or 1998 and tried to put some ideas about mapping in his hands at that time. Unfortunately, another leader (and former General) snatched the info from him. I doubt that he ever saw it. If you're a leader, I encourage you to use maps in this way. 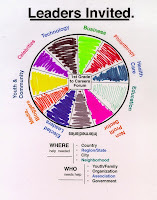 If you lead a youth serving organization, or youth publication, encourage your teens and volunteers to create stories using maps, and calling on resource providers to fill high poverty areas with needed volunteer-based tutoring, mentoring and learning programs, as well as the talent, dollars and technology each program needs to operate, and constantly improve. 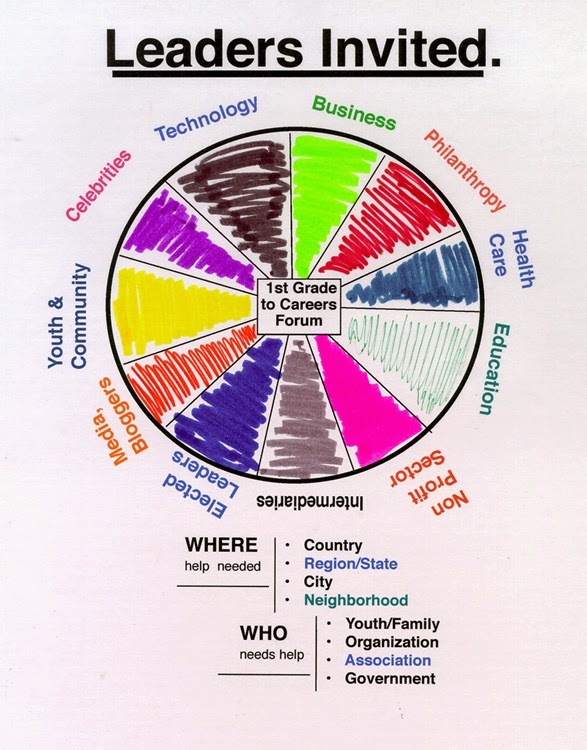 I'm looking for partners, sponsors, volunteers and a wide range of help to update my own mapping platform since I'm no longer operating as a 501-c-3 and have yet to figure out a business plan to generate revenue to support this work. Here's the front cover of the publication that I point to above. Five Presidents were featured and pledged to help the most at risk kids in America get mentors and find safe places to learn, play and connect during non school hours. 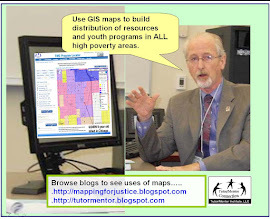 Too bad none of them, or Presidents elected since then, have done this consistently, nor used maps in their own efforts to mobilize resources to support youth serving organizations. 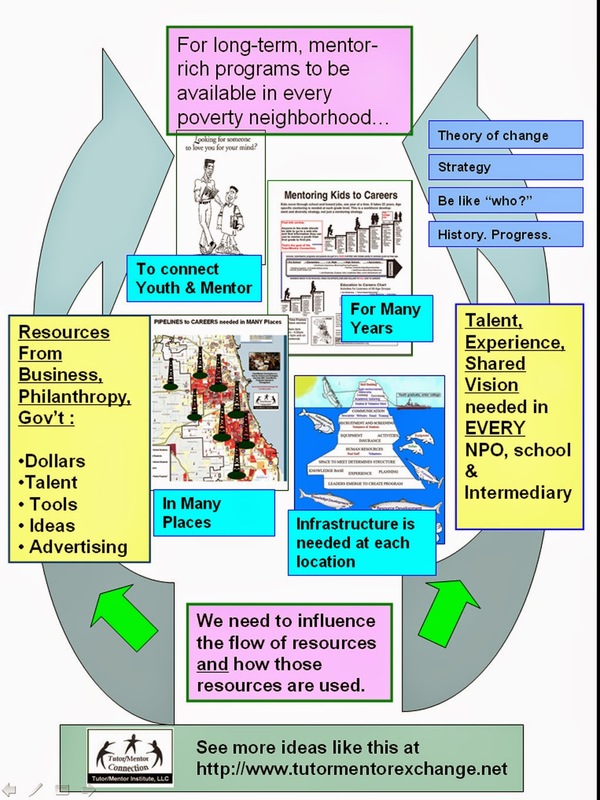 While this blog focuses on ways maps and visualizations can be used to communicate holistic strategies that reach more youth, in more places, with comprehensive, long-term support, the Tutor/Mentor Blog has a wide range of articles focused on recruiting talent and leaders to make such programs available in Chicago and other cities. I've been showing a variety of concept maps since last October, which illustrate goals, strategy and information I collect and share. 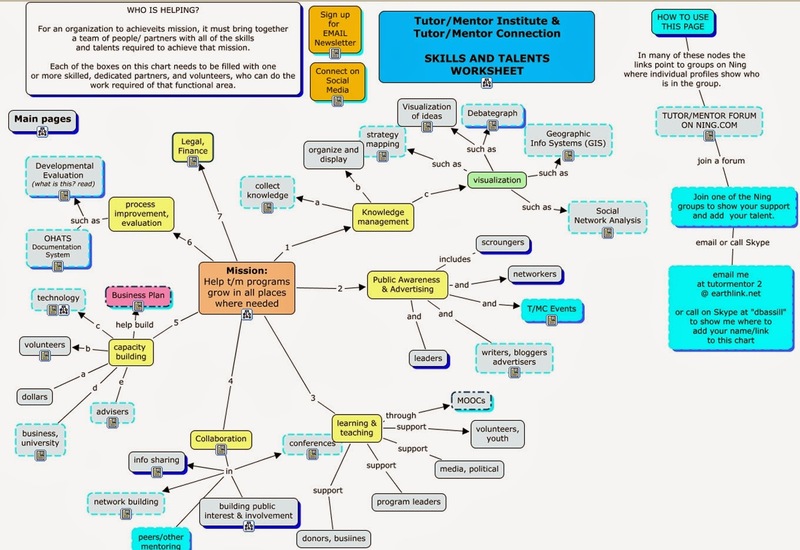 Below is a "talent map", showing the different talents needed to help me do this work. 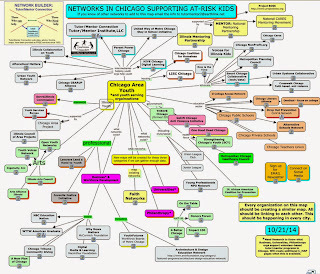 I think this map could be used as a team building tool by any organization, or intermediary. 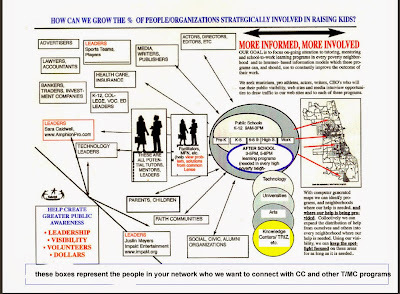 The center of the graphic, or hub, is the organization and its mission. The spokes in yellow, numbered from 1 to 7, represent key talents that are essential to organizational strength and mission success. In small organizations the leader may have many of these talents, but usually not all. As the organization grows, finding people who share the mission goals and passion, but fill specific talent roles, is one of the greatest challenges. Each of the talent areas highlighted in yellow, may have several sub-talents. For instance I feel technology talent is critical to the work I do. 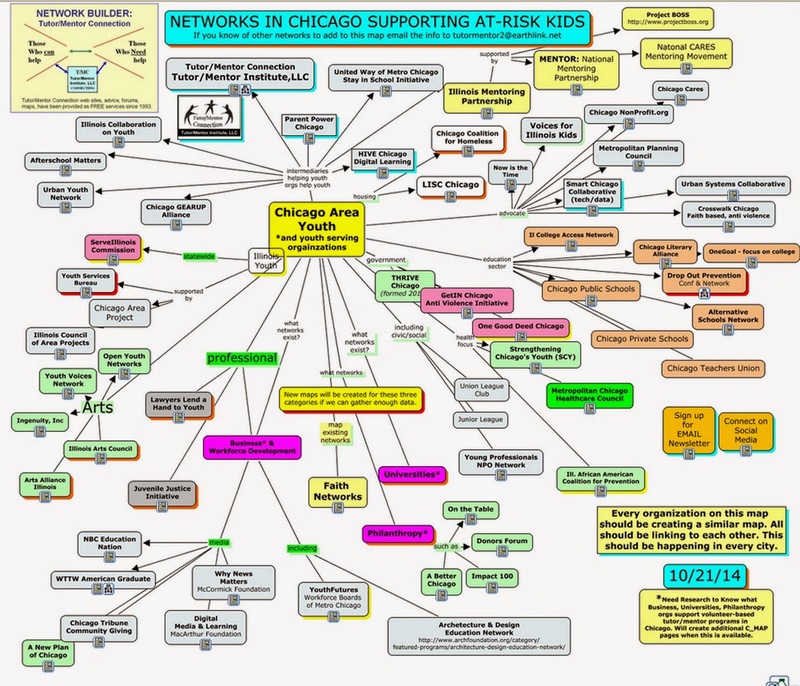 However, while some people might be able to build a web site, they may not have the skills to build data visualizations, concept maps, or geographic maps, which are key tools to use to communicate holistic strategies. In the Public Awareness spoke there may be some who are good working with traditional media, some who are good at writing stories, some good in creating video stories, and others good in using social media to expand the reach of your message. However, few people have all these skills and most non profits have few people with the time to do this work consistently, or the talent. Thus recruiting talent to fill these roles is another huge challenge for social purpose organization leaders....including myself. 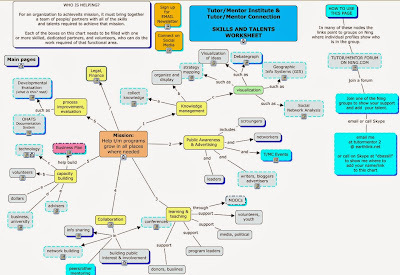 Another version of the Talent Map focuses on the network, or organizational background, talent comes from. 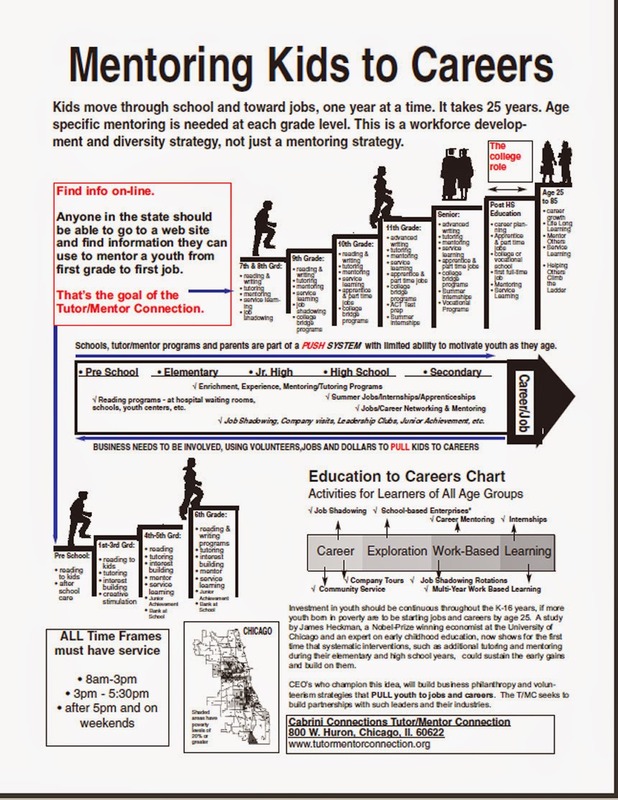 The graphic at the right illustrates how people who share the mission, vision, need to help recruit talent and financial support for the organization. 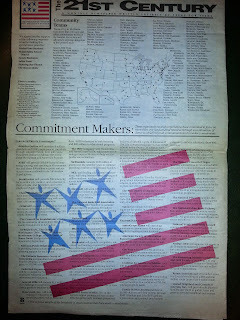 Recruiting people who have connections and civic reach within key industry, media, political sectors makes it more likely they have relationships that can draw the on-going support an organization needs. While I've been creating these visualizations and writing blog articles to share them, I've had help from interns from different universities. Visit this page and this page to see visualizations done by interns. 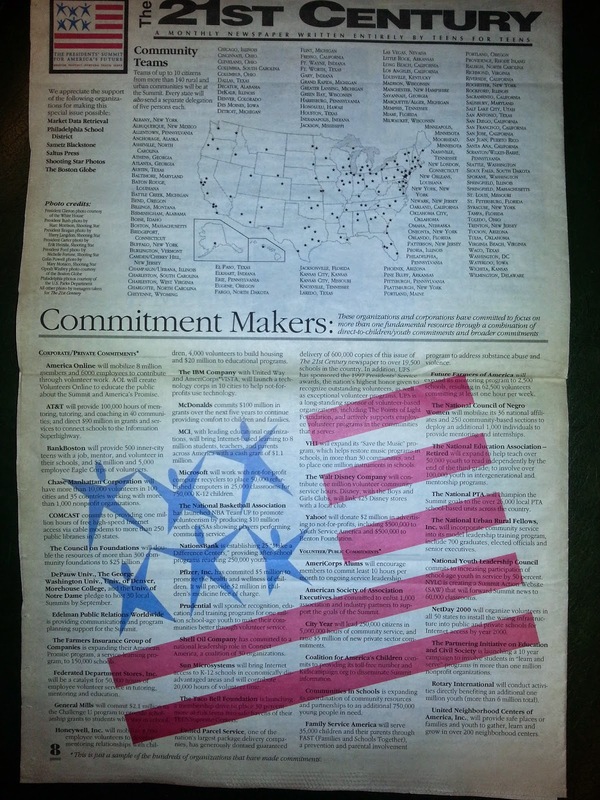 Consider doing some of this work yourself to support organizations you're involved with. Or offer your talent to fill these roles with the Tutor/Mentor Institute, LLC.